Tips and tricks on how to make pasta and to develop a foolproof technique! It's true that in some stores you can buy good fresh pasta already done. But it's all another satisfaction doing your own! 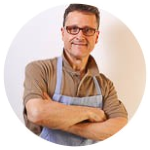 It's the basic for every fresh pasta recipe as lasagna, fettuccine, tagliolini, pappardelle, spaghetti, fazzoletti and filled pasta as ravioli, and tortellini. Now it's time to hand-roll it with a pin! The first tip is not to make it thick, pasta for lasagne, fettuccine and filled pastas must be thin or the dishes will suffer. Anyway, at anytime you can go for a good pasta machine. Today they are widely available if you don't have one. Go for Imperia pasta machines or Atlas which are the best. 1.2.3. 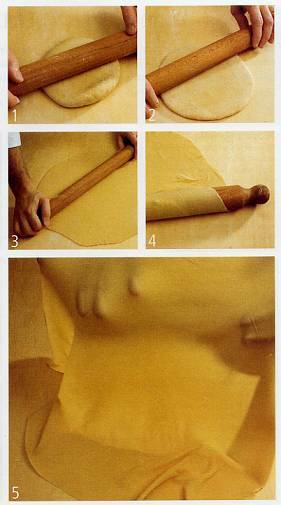 With your ball of pasta dough made, place it on a wooden pastry board slightly covered with flour. A wodden surface is the best! Begin by hands to flatten into a disc, then continue to roll with a pin until less than 0,04 inch (1mm) almost transparent. 4. Turn often up side down and roll out the sheet of pastry, and every so often dust flour over the working surface. It will keep from sticking. 5. Now the pasta sheet is ready to be rolled up and sliced into stripes to make lasagne or fettuccine. I picked this clear video which shows you how to roll homemade pizza dough. But don't worry the same technique works very well either for pasta dough. I don't think it will take you years to understand the superiority of hand-rolled pasta.